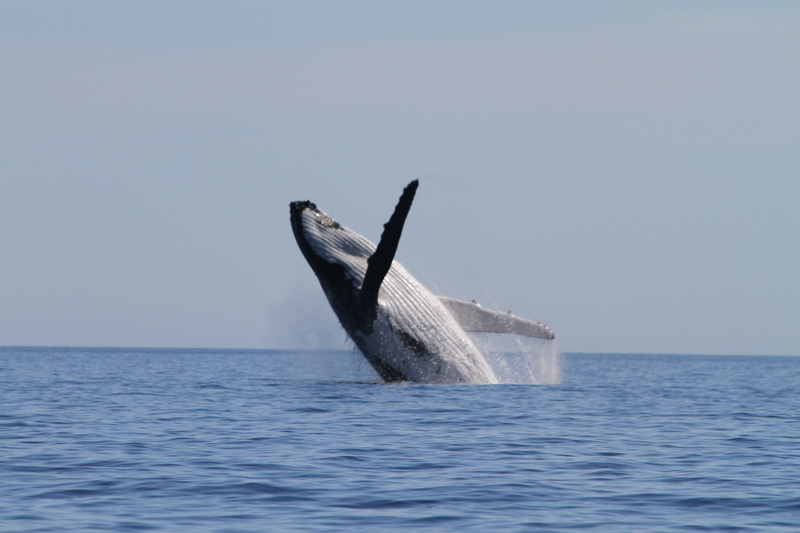 This week the “Behavioural response of Australian humpback whales to seismic surveys” (BRAHSS) project kicks off in Western Australia, with the aim of studying how these whales respond to the air guns used in seismic surveys. This project is one of the largest and most comprehensive studies undertaken on the effects of noise on whales. And this year I’ll be one of the marine mammal observers working there. 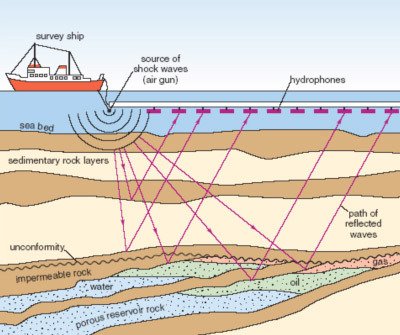 Seismic surveys are used by industry to locate oil and gas deposites beneath the sea floor. These surveys are also used by geoscientists conducting research on submarine rock structures. This is done using air guns, which produce noise using compressed air. This noise penetrates the sea floor and ‘bounces back’ off the underlying rock formations. Survey vessels tow an array of hydrophones (underwater microphones), which receive the reflected noise signals produced by the air guns. Scientists can examine the readings from this reflected noise to determine the structure of rock strata, and decide whether it is a potential oil / gas site. Unfortunately, such surveys produce quite a bit of noise and there are concerns regarding the effect of this on marine life. Where do humpback whales come into this? Australia is lucky enough to have two populations of humpback whales. Both populations spend the (austral) summer months feeding in Antarctica; but in the winter, the populations split with one migrating up the West Coast and the other up the East Coast of Australia to their tropical breeding and calving grounds. During this migration, and particularly on the south-bound journey when females are travelling with young calves, the whales sometimes congregate in coastal bays for a “rest stop”. This journey takes humpback whales past many sites of human significance, in terms of recreation, transport and industrial work. Thus it is important to understand how human activities may effect these animals. Of particular concern are the effects of underwater noise, as marine mammals have specialised hearing which assists with their navigation, foraging and communication. What will BRAHSS be doing? Broadly, the BRAHSS project aims to provide information that will reduce uncertainty in evaluating the impacts of seismic surveys on humpback whales. This will lead to improved management and mitigation measures, allowing such surveys to be conducted efficiently and with minimum impact on the whales. The project has previously run two successful research seasons off the East Coast of Australia in 2010 and 2011. It is now repeating these experiments on the West Coast population of humpback whales. This entry was posted in Research, Underwater Acoustics, Whales and Dolphins on September 8, 2013 by Sarah Marley.